Well now that it is actually September, I finally feel comfortable showing fall transitional outfits. I know a lot of fashion bloggers started doing this in July, but I don't believe in rushing the seasons. This is the time of year when the temperatures are either still warm, or fluctuating from cool in the a.m and p.m but hot in the afternoon. Layering is essential during these transitional seasons! 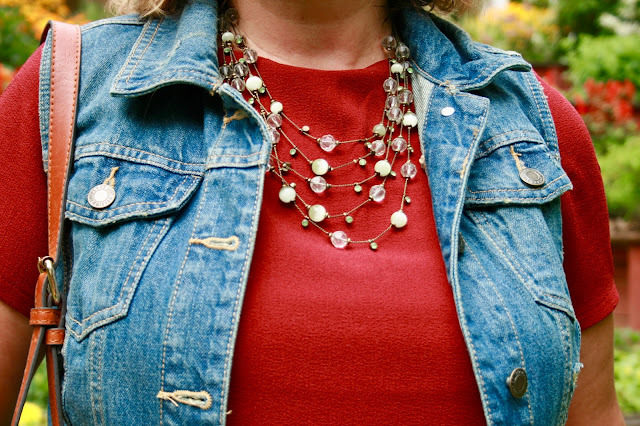 One of the things I do when choosing outfits for transitional seasons, is pick summer clothes with fall colors and add an extra layer that can be easily taken off as the temps rise or fall. This burgundy shift dress has short sleeves, so its great to wear in warmer weather, but the color is a fall color. The dress is a few years old. I've shown it to you before HERE, HERE, and HERE. I bought it at Charming Charlie's for only $20.00 and I think I got a lot of use out of it for as little as I paid for it! 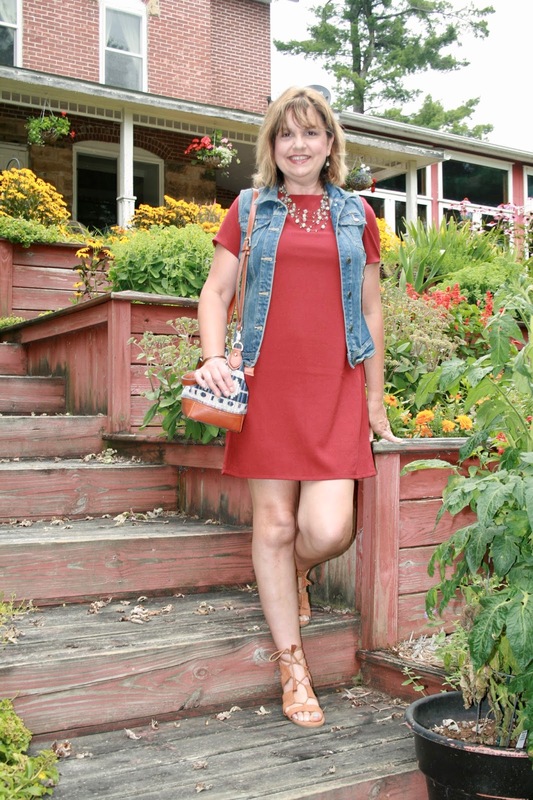 Styling this short sleeve dress is so easy because of the burgundy color. 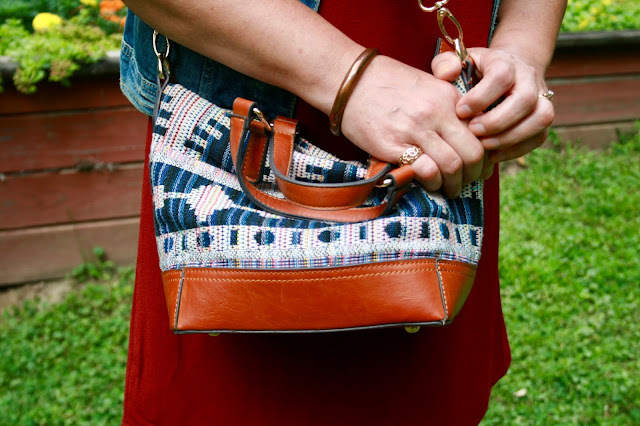 I just added a denim vest (old, Target), brown suede sandals (JCP), and a boho cross-body bag (old, Francesca's). My shoes I showed you on Monday's Fashion's Post. They are new, but I could not find them on-line. I bought them in-store at JCPenney on clearance for only $16.97. There is a similar pair HERE. For jewelry I wore a gold bracelet, gold rings, and gold and a blue/green necklace and earring set. Cute look and loving that color! The steps and your home make such a beautiful backdrop for these pictures too! Just perfect! Loving those lace up sandals! The color of your dress is great too! Thanks Jessica! I've had my eyes on these sandals for a little bit, so when they went on clearance I couldn't resist! I love these colors together for fall! I need to remember to wear my denim jacket more. Thank you! I forget about this vest in my closet a lot too! It's a great layering piece, I don't know why I keep forgetting to use it more. 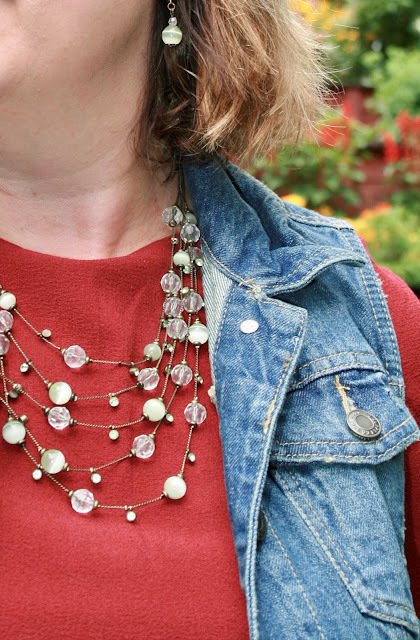 Adding a vest is a great way to transition to fall! What awesome tips, thanks for sharing! Thanks Caitlin! Thanks for visiting too! Amy, this is a great look. 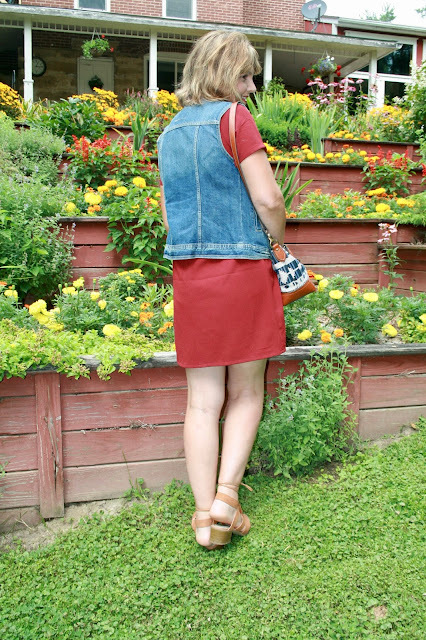 I adore a dress and denim vest combo. 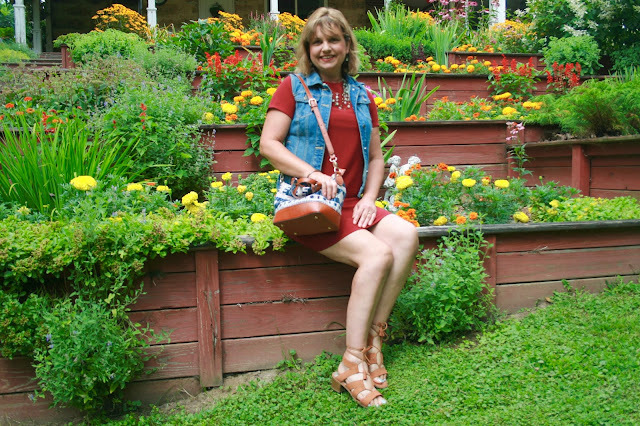 Your choice of sandals and bag were spot on in pulling together the whole outfit. Thank you for sharing your inspiration on my Fine-Whatever link up. What a fabulous way to style for two different season--especially when they often happen in the same day!! Thanks Jodie! Yup, that's so true! Lovely idea, Amy. Hope it's not too chilly right now, x. Thank you! No, not chilly yet. It's usually in the 50's early morning or evening but then 80 degrees in the middle of the day. We've had a few days in the sixties, but then it bounces back into the 80's the next week. That wonderful time of year when the weather can't make up it's mind! LOL! Perfect transition dress, the color is perfect for Fall. Love the denim vest too! Thank you! I love tee shirt dresses because they are so versatile! Thanks Jamie, I love it when I my clothes can pull double duty! A perfect transition! I'm inspired to get my vests out and use them with a few of my dresses! Thanks for this post! Thanks for linking up to Top of the World Style. Cute outfit!